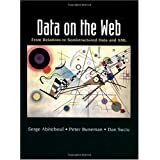 Data on the Web: From Relations to Semistructured Data and XML (The Morgan Kaufmann Series in Data Management Systems) ReviewFor the most part, this book covers the academic research on semistructured database management that started in the mid-90s (pre-dating the XML explosion - sometimes research is ahead of practice!). Such issues are not that interesting for folks who are doing bread-and-butter client-side XML development, and whose interest in "XML" and "databases" is limited to knowing how Oracle 8i implements its "XML out the top" package. However, the book is relevant to people who are already "in" the semistructured data management space - people who are thinking ahead to some of the potential directions that XML query languages might take, for example. The authors are prominent and well-respected in this area. Want to learn more information about Data on the Web: From Relations to Semistructured Data and XML (The Morgan Kaufmann Series in Data Management Systems)?